This article presents some secondary findings in my ongoing quest for information as to how the Enneagram points define themselves by the three instinctual drives: Self-Preserving, Social and Sexual. For purposes of this study, I sent out questionnaires to the Enneagram community, and this article represents my initial findings on the patterns that emerged from the contributions received from the participants. In particular, this article will focus on how the Enneagram Types by Subtype perceived themselves and more specifically the Internalized Image vs the Externalized Image. For example, what the nine types wished to add to the study of Instinctual Subtypes from their own internal experience of type. Various authors have used terms such as "instincts," "drives," "subtypes," "instinctual drives," "instinctual types," and "instinctual variants" to describe what I will refer to herein as "Instinctual Subtypes"; and as with the Enneagram types themselves, there are disparate views among the authors on the subject of Instinctual Subtypes. Surprisingly, however, to date very little material has been published on this subject. 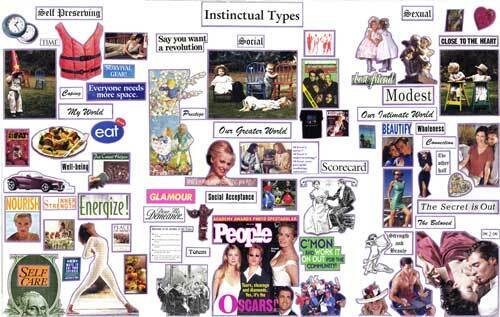 Research suggests that the study of "instincts" and "drives" was part of Oscar Ichazo's early teachings of "Enneagons." In 1970, Dr. Claudio Naranjo and others underwent intensive training with Ichazo in Arica, Chile, including both the Enneagram and Instinctual Subtypes. In 1971-73, Naranjo formed the original SAT groups ("Seekers After Truth") in Berkeley, California, and began incorporating the Enneagram and Instinctual Subtypes into his own teachings. In 1996, after more than 20 years, Naranjo again taught the Enneagram in the United States in Boulder, Colorado, including an in depth look at his view of the Instinctual Subtypes. It is my understanding that there are three instinctual drives or types -the Self-Preserving, the Social and the Sexual. Like the nine passions of the Enneagram points, the instinctual drives act as a force underlying our life strategies - often unconscious yet all-pervasive - and represent our most fundamental way of being. The three instinctual drives color the way we act, think, feel, and ultimately express ourselves. Each instinctual drive can manifest within each of the nine Enneagram types (in effect resulting in a total of 27 Instinctual Subtypes). Ichazo teaches that "the instincts are defined . . . as three fundamental reactions of our organism in order to sustain life. The interconnection between them produces a corresponding triad in the higher psychological levels, and the sensing of these three organic systems appear as our basic psychological levels in the form of instinctual centers of attention, whose demands we cannot ignore because they immediately threaten our survival." Naranjo teaches that " the instinctual type is one of three sub-personalities that is the "auxiliary passion." He suggests that outwardly the instinctual subtype can look positive, like a talent, or something of which one should be overly proud, but inwardly is a reflection of unhappiness with a price to be paid -, e.g., "the oyster is not too interested in the price of the pearls." He also teaches the origin and drive of each instinctual subtype: self-preservation arises in the belly and is associated with protection; social instinct arises in the tongue, and the desire to be appreciated; and sexual instinct is genital in origin and driven by sexuality, oedipal issues." Palmer teaches that, "like the nine passions, the behaviors called 'Enneagram subtypes' act as a hidden focus of personality type. Once it is discovered through self-observation, the subtype focus of attention is revealed as a behavior that is motivated by instinct (for survival, social relating, and sexual relating) dominated by the passion of type. The subtypes name a mental preoccupation in which the energies of the physical body (instincts) and the emotional energies of the passions are joined. Because the subtype focus of attention is an ordinary behavior, I have found them to be crucial pivots in the transformation of the nine passions into their higher opposites." Condon teaches, "The original formulation states that within each style there are three possible suborientations that people tend towards. The subtype is determined by whether you are unconsciously preoccupied with personal survival (self-preservation), whether you incline towards one-to-one relationships (intimate) or whether your style of relating includes a lot of people (social)." Riso-Hudson teach that " people can be divided into these three instinctual types (which they refer to as "instinctual variants") "simply by knowing the definitions of these categories, and without knowing the Enneagram types of the individuals . . . The Instinctual types can exist as a separate typology, but can also be combined with the Enneagram types in ways that explain some of the variations we see in real people that cannot entirely be accounted for by wings or Levels of Development." In theory, we are governed by all three instinctual drives, for they represent our most fundamental way of being, but one is generally more dominant and influential in our lives and defines the way in which we act out the passion of our Enneagram point.. If all three instinctual drives were in balance, we could function "perfectly" or "appropriately" to the needs of each situation. Nevertheless, such balance is rare, and usually one of these drives is "damaged" and commands an undue amount of our attention; and it is a person's most "damaged" instinctual drive that is overused and becomes dominant. The resulting imbalance distorts our perception of our essential needs, and we may find ourselves living large portions of our lives "in service" to this damaged drive. We strongly identify with one primary drive and with some secondary traits in another drive. On the occasion when two of the instinctual drives are equally dominant, it is noteworthy that the third drive is usually omitted. This perhaps still demonstrates the imbalanced use of the three very essential instinctual drives. The teaching of Instinctual Subtypes suggests that these fundamental instinctual drives need to be equally cared for and in balance in order to harness the energy needed to move toward transformation. The concept is that the energy expended in dealing with the instinctual drives' imbalance diminishes one's access to the energy necessary to move against fixation and toward transformation. The instinctual drives appear to be not only instrumental in distinguishing the different styles of manifesting our Enneagram type behavior, but also perhaps the stronger, more unconscious, yet all-pervasive element of our personality type. The underlying influence of the dominant instinctual drive can be quite powerful. In fact, the instinctual drives of two people are more apt to determine successful relationships than their Enneagram points, for a shared instinctual drive would be a more likely supportive common denominator than a shared Enneagram type. The reason is that the instinctual drive is more indicative of our "animal nature," the one enabling us to survive, whereas our personality also includes our essence qualities that we define as "human nature." These two together create a partnership that we call the personality or "false self." It appears that the degree to which our instinctual drive's impulses control our lives is subject to the same kind of energy as our Enneagram point. For example, we can experience our drives and passions mildly or intensely; we can feel some sense of control or very little control at all; and in addition, we can either embrace our particular instinctual drive or act totally against it. It is important to note that whether embracing the drive as an asset or viewing it as a liability it is still ever present and influential. More specifically, our dominant instinctual drive is, in actuality, our area of greatest weakness. Thus, when our sense of "survival" is threatened something has triggered whatever "button" happens to relate not only to our Enneagram point but, more important, also to our instinctual drive. The fixation then becomes even more severe as we take on the additional fears of the instinctual drive. The important factor here is that the triggering element of the fixation is the instinctual drive's issue. Nevertheless, the flavor will always be that of the Enneagram type, as the fixation and the drive are interactive, linked, and always related to the Enneagram type. In the context of the "false self" or personality, it is the instinctual drive that supposedly protects the survival of the Enneagram point and is called to the front lines when in stress. However, since the dominant instinctual drive is actually one's "weak link," its entrance in times of stress may ultimately produce no "protection" at all to one's survival, and in fact may exacerbate the level of stress and ultimate fixation. The real question is, how do we express anger, fear and desire? How do we experience illness and what types of illnesses do we have? How do we act when we're happy or sad? As an example, ask yourself how you like to spend your time. Do you tend to make sure your own needs are met and satisfied with the essentials of life (self-preservation)? Or does your attention go to being in the company of others and, if so, how many others, and/or do you need to be in service of others (social)? Or instead do you find that your ultimate expression of self is linked to the company of one significant other in an intimate and profound way, and that no matter where you are or what you are doing, you are always in search of that beloved special person (sexual)? I found that the instinctual drives appear to be not only instrumental in distinguishing the different styles of manifesting our Enneagram type behavior, but also perhaps the stronger, more unconscious, yet all-pervasive element of our personality type. Our instinctual drives motivate us in the ongoing human struggle to create and sustain relationships, to aggressively seek what we need to survive, and to defend what we have and fear losing. Clearly, the journey toward wholeness might well include the conscious exploration of these relatively untraveled, instinctual roads, and thus ultimately lead to a more balanced and integrated awareness. When pioneering any new area of study, there is always the possibility of controversy, risk, mistakes, misunderstanding, and misrepresentation, and this was no exception. With this study, I found that responses from each Enneagram point gave insights that deeply broadened my world view. A noteworthy point of interest with respect to the Enneagram Instinctual Subtypes is that the dominant instinctual drive (self-preserving, social or sexual) will shift to the other two subtypes as needed to ensure its influential role in this trialectic instinctual system. The way in which the dominant subtype employs the other two appears to be very specific and predictable. The dominant drive maintains the role of the commander in chief and the other two are channeled through its lens. Generally, this is very primal and often unconscious. This is especially apparent with respect to the human drive to seek a mate and pair bonding, but applies to all areas of life. If a relationship displays conflicting instinctual needs the dominant drive perceives it as a threat to security and acts accordingly. Confusion about the manner in which the instinctual drives manifest to create and maintain a sense of security is often the root of misunderstandings. Such disturbances in the instinctual drive are often the catalyst for seeking counsel or therapy. Self-preserving moves to Sexual For example, the self preserving subtype considers a mate as an essential need to maintain and insure security. Therefore, when in search of a mate the self-preserving subtype will feel anxiety and suspense until a mate is secured. In order to attract a mate, the self-preserving subtype will shift to their respective sexual instinctual drive to accommodate this fear. Outwardly the self-preserving subtype will behave like the sexual subtype, pay more attention to their desirability and will be sensual or flirtatious. At first, the self-preserving subtype will spend more time one on more with the possible mate. Once the mate is secured, the self-preserving subtype will return to basic routines that ideally would include the mate. An area of pain and disappointment for this subtype is when they have a mate that is unwilling to pay attention to issues of security and disrupt their need for inner calm. Social moves to Self-PreservingThe social subtype will think in terms more indicative of the self-preserving subtype when selecting a mate. This is very important to insure the desired security that rank and social status can provide. The social subtype seeks a mate with a shared social vision and similar values. This is necessary to fulfill the desire for a mate that will join them in their activities. Therefore, a secure social position is essential. Much attention is paid to the potential mate?s connections, rank and ability to provide financial security. This subtype enjoys bringing others together, feeling that ?the more the merrier?. They are often adept at creating the center stage and often use their home for social events, gatherings and causes. At first the social subtype will spend more time one on one with the potential mate. Once the mate is in place, the social subtype will return to outside interests, groups and/or activities, ideally, this is with their mate. An area of pain and disappointment for this subtype is when they have a mate that is unwilling to pay attention to their need for people, activities, causes and unwilling to share their interest in others. Sexual moves to Social The sexual subtype (one on one) will seek the greater world or social arena to find a desired mate. The sexual subtype is normally happy tucked away in a secluded setting with one significant other. However, when alone or in search of a mate, this subtype will behave much more like the social subtype. One must be with others to find ?the other?. Once the mate is selected, the social activity will be replaced by the dominant drive for time spent in union with the other one on one. At first the sexual subtype may spend time with the potential mate in the company of others. They become a pair even in groups. Then when the passion for deeper connection is ignited the sexual subtype will want to bond totally with their desired other. When the mate is determined, the sexual subtype will return to one on one style of relating. Ideally, this is intense time spent with the desired other or mate. An area of pain and disappointment for this subtype is when they have a mate that is unwilling to pay attention to their degree of connection and intimately share their deepest and innermost thoughts. "This is the definitive resource on the Enneagram Instinctual Subtypes, a true 'must' have for the Enneagram enthusiast.